The cooperative is often portrayed as the ideal organizational form to overcome poverty in fisheries. Recently however, different organizational forms have come into being that are more difficult to define due to their multifaceted and innovative nature. These are what Kurien (2013) deems a “new supported organizational form,” which can also be viewed as a form of “collective social entrepreneurship.” They are a type of collective action that are tackling complex, deeply rooted issues, most often related to poverty. The story of how these organizations came into being, how they have been sustained, and what they have achieved is few; this paper seeks to document one case. From December 2013 to April 2014, community participatory research comprised mostly of individual interviews was conducted with the Ocracoke Working Watermen’s Association (OWWA), based on the island of Ocracoke, North Carolina, USA. These nationally recognized efforts not only enabled the watermen to preserve and strengthen their livelihoods and culture but also helped to maintain the island’s tourism industry. This paper discusses the evolution of this organizational form and how it has helped keep watermen on the water and revive and sustain a small-island community’s fisheries culture and related tourism. In a larger sense, the paper aims to demonstrate why a new supported organizational form and collective social entrepreneurship were needed to help reduce the vulnerability of poverty the watermen and community of Ocracoke. This paper examines two separate but engaged entities: the Ocracoke Working Watermen’s Association (OWWA) and Ocracoke Seafood Company (hereafter referred to as Ocracoke Seafood) in Ocracoke, North Carolina, USA. The paper explores how the Oracoke Foundation Inc. (OFI), a non-profit organization also based in Ocracoke, helped to develop a new supported organizational form with these two entities and how it was akin to collective social entrepreneurship (CSE). Within the introduction, what is meant by the term “poverty” in the context of the small island community of Ocracoke in the USA must be further explored. Although the island is part of a county that faces high unemployment rates and low per capita income, the term poverty is not used strictly in the economic sense. Indeed, none of the watermen 1 interviewed felt they were “poor” or that they “lived in poverty.” Rather, poverty in the context of the Ocracoke community can be viewed through the lens of vulnerability and marginalization. Watermen in Ocracoke have been particularly vulnerable to experiencing a loss of their fishing rights, mostly through a variety of regulatory measures at the state level. These include moratoriums on new commercial fishing licenses, seasonal fishing bans, and more stringent measures related to specific fish species and fishing gear. As individuals, the watermen often expressed feeling marginalized, as their individual opinions and expertise on environmental issues were either not taken into consideration by regulators or were not given significant weight. This vulnerability of losing some or all of their fishing rights could result (and in some cases has already) in a loss of some or the watermen’s economic livelihood. This is particularly daunting because their economic livelihoods are also threatened by a variety of other external factors, including increased pollution, cheaper seafood imports from abroad, rising fuel costs, and raised residency taxes. With these steep vulnerabilities, there is very limited involvement of youth in commercial fishing. Lack of youth involvement in commercial fishing was cited as one of the “one of the biggest issues” in Ocracoke (Hilton, David, pers. comm. ), as many youth leave the island in search of jobs. Some interviewed stressed that the decline of watermen on the island has caused the decline of the overall industry in Ocracoke, as there “just aren’t enough fishermen anymore” (Gaskill, James Barrie, pers. comm.). A loss of fishing rights and lack of youth involvement could ultimately result in a loss of their fishing heritage and culture, a deep vulnerability that is impossible to place an economic price on. These vulnerabilities at the individual watermen level collectively add up to a larger weakening at the community level. As an island community, Ocracoke relies on their small but dynamic local fishery to supply and attract their tourism industry, which is the island’s primary economic sector. If the commercial fishing industry on the island were to die, tourism would be significantly threatened, as without any significant local seafood supply and with the disappearance of the authentic fishing village feel of the island, Ocracoke could become yet another ubiquitous beach town that dots the North Carolina coast. Tourists often remark they come to the island of Ocracoke for vacation specifically because of its uniqueness as a small fishing community, a place in which they can watch the boats bring in their dinner. As this paper will detail, the emergence of the new supported organizational form with a CSE approach came out of an immediate need to save the last fish house on the island. Without the fish house, which served as a wholesale buyer, commercial fishing on the island would no longer be viable as there would be nowhere to sell their fish, obtain supplies, etc. However, the collective action that resulted due to the need for a new fish house addressed the overall vulnerability the watermen had been experiencing for much longer. This paper aims to demonstrate how collective action addressed the watermen’s and larger community’s vulnerability by using a new supported organizational form and taking a CSE approach. It aims to show why this kind of approach is needed and where it may be replicated in other parts of the world. In a scoping study on “Collective action and organisations in small-scale fisheries”, Kurien (2013) lays out a brief history of the evolution of collective action and organizations in the small-scale sector. According to the study, the first type of organizational form was the “customary organisation,” developed at least from 1500 AD onwards, which were “identity-oriented, consensual and community-initiated.” Beginning in the 1900s, “cooperatives,” which were “sector-oriented and supported/co-opted by the state” emerged. Associations and unions largely came into being in post-1980 onwards (although in the USA, this was mostly in the 1920s and 1930s), and were “sector-oriented, class-based and largely adversarial to the state.” Beginning around 2000 onwards, Kurien deems the next organizational form to develop the “new supported organizational form,” based on “collective action, which is cooperational, multi-interest and multi-layered with revived interest by state, international organizations and NGOs” (Kurien 2013, 6). He notes that there are many interesting new supported organizational forms, which need to be observed closely. This paper hopes to provide such an observational case. Within this history, Kurien claims that customary organizations in their original form have been largely relegated to history. Cooperatives also are being abandoned as they often become run by the state rather than to genuinely help people. Associations and unions are also on the whole in decline, as Kurien claims they are unable to sustain their campaigns for development (Kurien 2016, 21). It is within this general context of minimal successful collective action that the new supported organizational form has been developed around the world. There has also been increased concern worldwide that small-scale fishing communities are quickly being marginalized, with their fishing rights threatened in the name of state and national objectives of fisheries management. Kurien writes that as a result, there has “been an evolving consensus on the part of fishing communities, the NGO sector, international development organizations and many governments” to support a new form of organization and collective action. Interestingly, the presence of civil society organizations (or NGOs) serves as “watchdogs” as they provide a type of “social pressure” with the aim to keep these initiatives “more sustainable” and “on track” (Kurien 2013, 20–21). This is particularly true of this organizational form. Kurien also writes that these organizations are “multi-purpose,” and in this case, the “new supported organizational form” took on a multi-purpose approach by taking on the concept of Collective Social Entrepreneurship (CSE). This concept has been aptly defined by Montgomery et al. (2012), as the “collaboration among similar as well as diverse actors for the purpose of applying business principles to solving social problems” (376). A key to the CSE approach is that it be done via collective action. Indeed, Sud et al. (2008) notes that, in certain social contexts, social entrepreneurship will be unable to solve social problems if taken on by any single social organization. Instead, solving such problems will require a collaborative effort of many actors, across different sectors and institutional boundaries. Pies et al. (2010) similarly suggest that social entrepreneurship must work at various levels of operation in coordination, thus moving from the single social enterprise to a collective of organizations and subjects. This is very much what happened in the case of Ocracoke, as the context of vulnerability there required a multi-faceted and collaborative solution. Thus, you have non-profit actors working alongside watermen, community members, and supporters at the regional and state level, to create an organizational form to address this vulnerability. Not only were several actors involved, but these diverse actors worked together to create a collective of organizations, including non-profit, educational for-profit. Though interesting to look through the CSE lens for this particular case study, the paper aims to conclude by examining how CSE-inspired collective action efforts can strengthen small-scale fisheries worldwide, in both developed and developing countries. This case study was conducted for the Food and Agriculture Organization (FAO) of the United Nations. From December 2013 to April 2014, research was conducted primarily through interviews of the watermen that make up these organizations as well as with community, non-profit, and academic stakeholders within the small-scale fisheries sector. A total of 22 interviews were conducted, initially selecting interviewees that were leaders in these CSE efforts, and thereafter asking individuals for interviews based on recommendations from initial interviewees. Interviews were then transcribed and read through to analyze for reoccurring themes, such as Gender, Youth involvement, Success predictor, Difficulty, and Competing interests. Once codes were identified, transcripts of the interviews were then analyzed in order to be coded. If a quote was particularly indicative of a certain code, it was copied into a document to be potentially used within the case study itself. 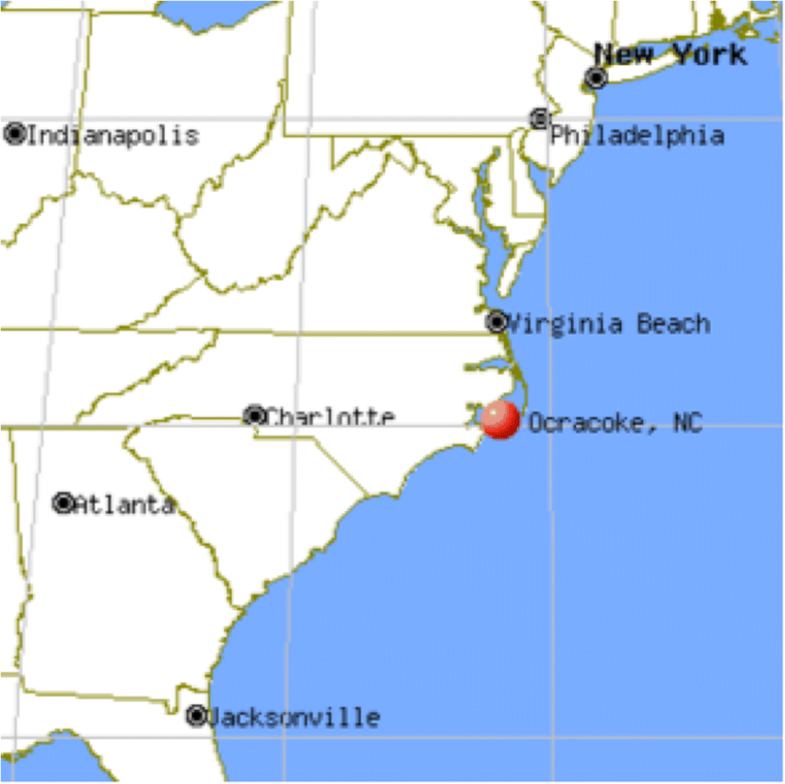 Ocracoke is part of the North Carolina Outer Banks, and is one of a chain of islands that form a barrier between the Atlantic Ocean and the sounds behind the islands Balance 1989). As one of the most remote islands in the Outer Banks, it can only be reached by one of three public ferries, private boat, or private plane. According to the 2010 census, the island’s population was 948 (Census Viewer 2010). Other than the village of Ocracoke, most of the island is designated as part of the Cape Hatteras National Seashore with the village listed on the National Register of Historic Places (Fig. 1). The island of Ocracoke is part of Hyde County, which is a mid-eastern coastal county currently classified by the state as a Tier 1 county, 2 meaning that the county is facing a combination of the following issues: high unemployment rates, low per capita income, and low percentage growth in population. As an isolated community with a small population, tourism serves as Ocracoke’s main economic activity. Most of the jobs on the island are low-paying service industry related and individuals require one or two additional jobs on top of their primary employment. In terms of fisheries, Ocracoke has a strong fishing heritage with both commercial and recreational fishing contributing to the economy (Balance 1989). Interviewees estimated that there were about 35 commercial watermen on the island, with the majority fishing part-time, which provides a vital source of supplementary income as well as access to local seafood for the community and tourism sector. Part-time work in the tourism sector, including sport fishing, duck hunting, and water sports, provides additional income. North Carolina’s fisheries have been facing significant declines in landings (both in volume and value) as well in the number of commercial fishers employed. According to Andreatta et al. (2011), from 1997 to 2007, there was a 53% decrease in the total number of pounds landed in the state, excluding the menhaden purse seine fishery. The value of commercially harvested fish and shellfish decreased by 25%, with the deflated value decreasing by 42% over the same 10 years (McInerny and Bianchi 2009). Some commercial fishers contend that one of the causes for these declines is increased market competition from cheaper, imported seafood products (Andreatta et al. 2011). Indeed, imports supply the majority of consumption in the country; it was estimated in 2011 that about 91% of seafood consumed in the USA was imported, up by 5% from 2010 (NOAA 2011). Many watermen interviewed for this case study also reported increased regulatory management with the government’s aim to prevent overfishing as another strong reason for the economic decline of the state’s fisheries and the decreasing number of commercial fishers. The result is that many watermen in North Carolina have begun leaving the industry. In Carteret County, an area with a strong history of commercial fishing activity, one study found that from 1994 to 2008, the number of commercial fishers declined by 48% (McInerny and Bianchi 2009). Moreover, the number of wholesale seafood packing facilities in coastal North Carolina declined by 36% from 2001 to 2011 (Garrity-Blake and Nash 2012). In February 2006, the Ocracoke community learned that the last and only remaining fish house was being put up for sale. The fish house had been privately owned with a 99-year lease in place and was put on the market for US$325,000. Ocracoke watermen recognized that with no fish house on the island, fishing would no longer be a viable economic activity as they would not have access to a convenient place to sell their fish, distribute it wholesale, or purchase bulk ice. The community also greatly valued Ocracoke’s fishing heritage, wanting to maintain fishing on the island and ensure its viability for the future. Meetings began to be held within the community about saving the fish house and sustain the commercial fishing sector. When the fish house was put up for sale, Robin Payne, a community member and now the Director of OFI, was in the process of establishing OFI, a non-profit organization. Payne did not grow up on Ocracoke, but had moved to the island and had a strong interest in preserving the island’s heritage. Payne had an educational and professional background in non-profit organizations and cultural preservation. While initially developing OFI, Payne began facilitating a series of meetings with the watermen, which served as an informal needs assessment. Meetings discussed what the watermen’s needs were, why the fish house was important to the community, and long-range goals for Ocracoke’s fisheries. The watermen demonstrated that the fish house was a vital part of the Ocracoke community due to the fact that it helped to create and retain jobs, contributed to Ocracoke’s maritime cultural heritage and quaint fishing village atmosphere, helped to develop and maintain tourism, provided access to fresh and local seafood, and added to the local economy via sales tax. Educating visitors to Ocracoke about its fisheries was deemed necessary (Ocracoke Foundation 2010). 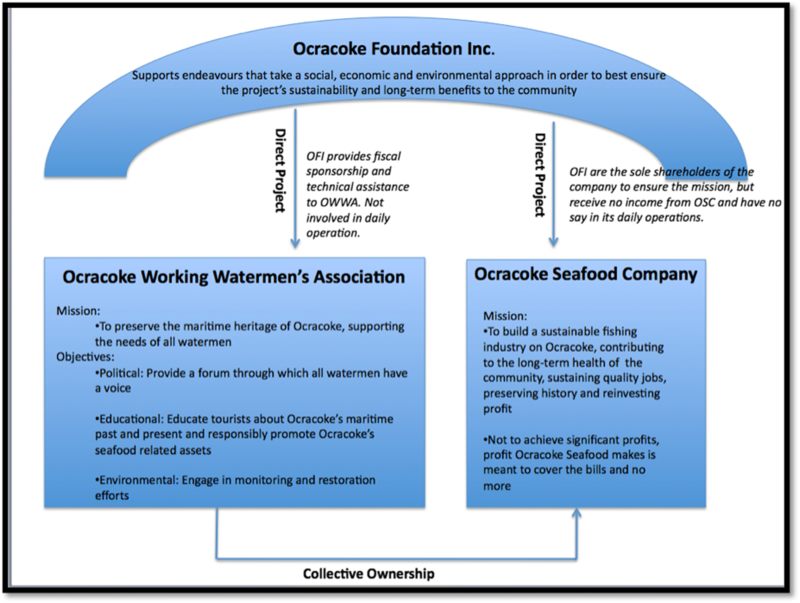 Based on this needs assessment and careful consideration, the organizational form between OFI, OWWA, and Ocracoke Seafood was developed and work began towards establishing OWWA and Ocracoke Seafood. Once OFI, OWWA, and Ocracoke Seafood were established, the first phase was initiated, with the goal to purchase the fish house and lease, transferring the lease title from the Payne’s (who initially bought the lease for 1 year as a personal loan to the watermen) to Ocracoke Seafood. In order to achieve this goal, this first phase focused on fundraising, organizing community fundraisers (oyster roasts and fish-fry’s), providing outreach for individual donations, applying for grants, and garnering political support for these efforts. Nearly all of the watermen were involved in helping with community fundraisers and outreach for donations, while OFI led the grant applications, educational/promotional outreach at off-island events and press relations. Local and political leaders were also involved in these efforts. In terms of grants, OFI applied for and received the following grants from state and county organizations: an interim loan from Hyde County’s Revolving Loan Fund (US$325,000), The NC Rural Economic Development Center (US$325,000), and Golden LEAF Foundation (US$407,710) (the latter two are funding organizations for the state). Payne led the writing of the grants, along with Gene Balance, now Ocracoke’s Seafood Data Manager. Soliciting watermen’s inputs for incorporation into the grant applications was crucial, and Payne worked to ensure it was a participatory process by daily phone calls, emails, or taking questions directly to the “steering wheel” of the watermen’s trucks (Payne, Robin, pers. comm.). Additional meetings were held with the watermen in order for her to get the group’s overall feedback. Using initial funding from the Hyde County Revolving Loan, the fish house business and lease term (set to expire in 2074) was purchased in November 2007 by OWWA for US$325,000. At this time, the Payne’s lease over the fish house was transferred to Ocracoke Seafood and the necessary federal and state filings were completed. Once the fish house was purchased, the second phase was initiated with the goal to renovate the existing structure, update the equipment, and obtain the required permits and licenses in order to process seafood in a code compliant structure. This was a significant amount of work and expense, as nearly half the building had to be taken down, a new foundation poured, and the building rebuilt with a new roof. Renovations took over 4 months, paid for by funding from the Golden LEAF grant (US$407,710). As with fundraising, renovations were a “community based effort” with “a lot of people giving a lot of time without pay” (Hilton, David, pers. comm.). For instance, the dock was entirely built by community members and watermen. Contractors were hired to complete other more technical aspects of the reconstruction. Renovations were completed in the spring of 2009, and the business began operating in its renovated space immediately afterwards (Table 1). OWWA and Ocracoke Seafood are separate but linked entities that are multi-faceted and innovative and have evolved with a CSE approach with significant support from OFI, the watermen themselves, the larger community, politicians, and dedicated state organizations (Fig. 2). During research for this case study, conflicting and confusing information at times arose on the structure of the organizational form itself, governance, membership, and other aspects. For instance, when asked what kind of organizational form Ocracoke Seafood and OWWA were, watermen provided a variety of answers; business, semi-cooperative, cooperative, non-profit organization, and/or project. There were also unclear and conflicting answers as to how entities worked together and were distinct from one another. This confusion seemed to stem from the structure’s hybrid nature, as well as its informality at the time that this research was conducted. Rather than this confusion being viewed as negative, it demonstrates both the inclusivity of the new supported organization form, as well as its complexity, providing insight into how this complexity can play out in the day-to-day reality of collective action in small-scale fisheries. In Table 2, a range of other organizational forms that watermen considered during the needs assessment based on their needs and goals is presented. Private ownership was considered but not viewed as feasible as it would have prohibited grant funding, resulted in a single perspective on how to run the business, lacked long-term security, and not all watermen would be served. A traditional cooperative was also considered, but watermen brought up concerns with cooperative management and organizing ownership among 30 plus watermen. Likewise, OWWA and Ocracoke Seafood could not legally be owned publicly by Ocracoke nor could they be housed under an existing non-profit organization, as none existed to provide long-term stewardship. Finally, although forming the two entities as its own, single functioning non-profit organization was considered, watermen made it clear that they did not want to spend their time managing a non-profit organization. Based on this exercise, it was decided that OFI, the new non-profit organization, would serve as the “parent organization” for both OWWA and Ocracoke Seafood, with the leader of OFI managing the non-profit. This would mean that OFI would provide fiscal sponsorship to OWWA, its direct project. OFI would also be the primary shareholders of Ocracoke Seafood, its for-profit subsidiary. Therefore, the watermen would not need to provide any management of the non-profit, but could focus on fishing. Though the scope of the OWWA and Ocracoke Seafood is small, involving only around 35 watermen, the initiatives driven and supported by the watermen reflect an example of strong collective action in small-scale fisheries that has had both a direct and indirect impact on vulnerability and marginalization. Below, a description of each entity seeks to clarify their different structures, goals, and work. OFI is a non-profit organization that was established to assist the community of Ocracoke with its educational, social, infrastructure, economic, environmental, and social needs. This work is done through direct projects or assisting fledging groups in the development of a separate entity provided it falls under OFI’s mission guidelines. The development of OWWA and Ocracoke Seafood was OFI’s first formalized attempt in working towards these aims, and thus, the experience was an iterative process that helped OFI distinguish themselves as an organization which guides their future work. After OFI incorporated as a non-profit organization, OFI’s Board of Directors unanimously approved the establishment and incorporation of Ocracoke Working Watermen’s Association (OWWA) as a direct project under OFI’s non-profit umbrella in August of 2006. OWWA has a separate Board with mission specific guidelines and operates under its sponsor’s (OFI) non-profit status. The group is, however, considered a separate legal identify. Practically speaking, this means that OWWA is able to receive tax-deductible donations directly from donors. In May of 2007, OFI also incorporated Ocracoke Seafood, a separate entity that is a for-profit subsidiary under OFI’s non-profit umbrella. Ocracoke Seafood serves as a base of operations for about 35 watermen from Ocracoke as well as for watermen from neighboring communities along the coast. The business has a wholesale and retail side that is open from the spring through early December, when it closes for the winter as fishing substantially slows. After covering expenses, all profits made are either reinvested in the business or in a profit sharing program that is given back to watermen based on individual annual landings. The MOU between OFI and OWWA is the legal framework that demonstrates the organizational form of OWWA and Ocracoke Seafood. As stated in the MOU, OWWA is formally a direct project that OFI incorporated. Ocracoke Seafood is a for-profit subsidiary that OFI also incorporated. As such, OFI serves as the sole shareholder in Ocracoke Seafood, thereby owning all stocks for the purpose of ensuring the mission. OWWA annually elects representatives for the main economic activities of Ocracoke watermen, including fin fishing, crabbing, clamming, and charter fishing. It is the role of these leaders to represent their subsector’s perspective within OWWA, meaning that they gather input from those watermen and if needed, speak on behalf of their subsector during an OWWA meeting. In addition to these representatives, OWWA also elects a Board of Officers for Ocracoke Seafood: a President, Vice-President, Treasurer, and Secretary. All proposals related to Ocracoke Seafood are put to this Board for final acceptance. All of these governance positions are unpaid volunteer positions that serve for a 1-year term with the position then being open for re-election. Governance provided by OWWA is explicitly conducted through the election and leadership of the representatives and Ocracoke Seafood Board of Officers, but governance goes a step further with OWWA reviewing the year-end financials as a group, which provides credibility and transparency to the business. Furthermore, OWWA’s governance of Ocracoke Seafood is underscored in the MOU when it states that the hired Manager of the company must follow the direction of Ocracoke Seafood Officers who in turn need to take into consideration OWWA’s group decisions and long-term plans. OWWA’s most significant activity is at the political level, engaging in political activities in a number of different ways. The first is via their regular meetings, which provide a forum to discuss new and impending fisheries regulations, mostly at the state level. Mr. James Barrie Gaskill, the oldest waterman in the group, explains that leaders discuss which regulations may be coming in the near future, “what the consequences are going to be, what we can do, what we need to do and how it will effect us” (Gaskill, James Barrie, pers. comm.). These discussions not only further watermen’s understanding of new regulations, but also aid in helping watermen learn how they may need to adapt their gear types and fishing practices. OWWA also responds to proposed regulations by presenting their collective comment during public commentary hearings, in which watermen are invited to provide their opinions on proposed regulations in front of the North Carolina Division of Marine Fisheries Commission. This is a careful process, with OWWA discussing the proposed regulation, preparing their collective comment as a group, and then traveling to the hearings to present it. 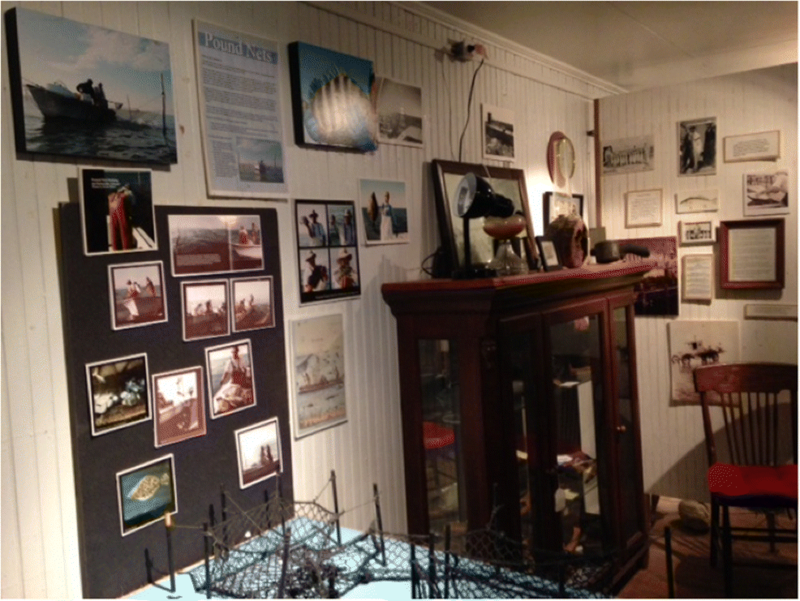 Another significant activity of OWWA is at the educational level with the “Working Watermen’s Exhibit.” The exhibit is located in a former fish house (now a nationally registered historic structure), and aims to highlight how fishing, past and present, plays an important role in connecting the local community, environment, traditional workplace, and the economy. The exhibit has short video clips on different topics, printed materials, and models set up of traditional fishing gear such as pound nets. In addition, the exhibit explains how the fish house was saved, how OWWA works, and how fishing in the natural environment can be practiced responsibly. The exhibit serves as a destination point for visitors, who can informally walk in to view the exhibit as well as schedule more formal visits for classes and special events. As a destination point, the exhibit provides a unique setting for watermen to give talks, whether on fishing heritage, current oyster restoration efforts or other related topics. The ultimate goal of the exhibit is not to show what used to be, but rather that fishing is “still very much alive” in Ocracoke (Payne, Robin, pers. comm.). In addition to the exhibit, OWWA holds free classes for the public in the summer on wetlands, oysters, crabs, and other topics. Five classes are offered per week in the summer season (Fig. 3). Lastly, OWWA conducts activities within research and restoration. OWWA, with the help of OFI, currently has an oyster spat monitoring program to evaluate the health of oyster stocks. In addition, they instituted an oyster restoration project in the spring of 2010, which involved obtaining an oyster lease on a historic oyster bed and planting oyster shells to help initiate the process of oysters growing. Thus far, the restoration has proved successful as they learn how to grow oysters closer to the island while keeping them disease free. On the wholesale side, Ocracoke Seafood buys from about 20 to 25 watermen regularly when in season. An additional ten watermen sell to Ocracoke Seafood in high fishing season. Hardy Plyler, the Manager of Ocracocke Seafood, estimates that around 90% of these volumes are then sold about two to three times a week to Wanchese Fish Company, a wholesale and distributor based in the Southeast USA. The company has four paid full-time employees in season: a General Manager, Retail Manager, and Wholesale Floor Manager and Data Manager. On the retail side, Ocracoke Seafood has a seasonal shop that provides local seafood for community members and tourists. Plyler estimates that an annual average of about 10% of volumes are sold at the retail level. Watermen are proud of the fact that the retail store mostly features inshore fish caught by the Ocracoke watermen as well as some offshore North Carolina caught fish (tuna, tilefish, mahi mahi, wahoo) from Wanchese Fish Company as these are popular species with tourists. All prices paid to watermen and received from Wanchese Fish Company are posted publicly in order to be transparent about the profit margin Ocracoke Seafood is making. As a group, OWWA annually meets to go over profits and discusses how it may be used outside of regular operating costs. If there is a profit remaining after fixed costs, repairs needed, etc., the group does a dividend return, giving watermen a percentage of this profit based on their catch volume that year. The most immediate successful outcome of OWWA and Ocracoke Seafood was in creating a self-reliant fish house, which allowed the fishing heritage of Ocracoke to be retained, maintained the quaint fishing village atmosphere for tourism, sustained and improved fishery livelihoods (saving an estimated 28 full-time equivalent jobs), enabled access to fresh local seafood, and contributed to the local economy. In a state and local context where the commercial fishing industry is thought to be dying, this is extremely significant. In terms of fishery livelihoods, between 2007 and 2013, Plyler estimates that Ocracoke Seafood has paid between US$400,000 and 500,000 a year to local watermen, with gross sales of US$750,000 to 900,000 a year. For the watermen, this serves as a significant and vital part of their income. Though the business has faced some challenging years with hurricanes, which has led to smaller volumes landed, the business has been profitable since it began operating in 2007. A profit sharing dividend return has been given twice, with the most recent being in 2013 when US$7000 was divided among the watermen. Though not a large amount once distributed, Plyler notes that this distribution “galvanizes the group” in the short term (Plyler, Hardy, pers. comm.). These efforts have not only sustained fishery livelihoods but also generated increased interest in fishing from youth. Though the majority of watermen participating in OWWA are older than 35, according to a number of watermen, there is a growing presence of younger individuals in high school and university that are participating in commercial fishing and OWWA activities. One waterman, Bill Evan, noted, “You have kids getting up before 5am to fish their nets,” and claims that there are now “more kids in high school that are part-time fishing than I can ever remember.” This revival in youth’s participation has been attributed to Ocracoke Seafood, as it has been a “bright light” helping to “show the kids there is something different here that they can take part in.” This is notable, especially in an island community where jobs are few and far between. “People say kids should do something else,” Evan mused, “but Wal-Mart isn’t around here, (fishing) is the job here” (Evans, Bill, pers. comm.). Though with less concrete outputs and thus hard to quantify, OWWA’s more long-term educational research and political efforts have also had a significant impact on vulnerability in Ocracoke. These efforts have been successful in educating the public (including tourists) about local fisheries, reviving the local oyster population and perhaps most significantly, have provided a respected unified opinion on fishery regulations and management issues. Many of the watermen interviewed spoke proudly of the fact that OWWA provides a unified voice on fishing regulations as “opinions given in mass have a huge weight” (Gaskill, Morty Jr., pers. comm.). Over time and with strong and organized leaders, OWWA has gained significant respect from other fishery organizations, political leaders, and the NCDMF. These stakeholders “really listen to (OWWA) now” says Barrie, as OWWA tries to “work for things instead of against everything.” Barrie explained further that OWWA has learned that at times, they will need to “adapt and understand the position” of the NCDMF while at others, respectfully “disagree and explain to them” the reasons why (Barrie, James, pers. comm.). OWWA also reaches out to North Carolina citizens through their website and email list about political issues, urging citizens to contact state legislators in an effort to stop relevant bills from passing and supporting others. During research, it became clear that the innovative, multi-faceted organizational form that makes up OFI, OWWA, and Ocracoke Seafood was the basis for its success. This new supported organizational form with a CSE approach provided a sense of sustainability that no other type of single organizational form could have. This analysis will explore why this type of organizational form was needed and how it is akin to the CSE approach. In general in the USA, there is no strong enabling legislation to support or promote community-led organization in small-scale fisheries in the USA. Instead, such organization is done mostly at the grassroots level, garnering support from non-profit organizations and communities. Within the state of North Carolina, where this case study takes place, most of the collective action that has taken place has been in response to fishery regulations in the form of auxiliaries or associations. OWWA could be seen as one extension of this. The new supported organizational form was needed in part to fill this institutional void, in order to provide a supportive background. A non-profit organization was the most able type of supportive background to lead the organizational form. A non-profit organization has the ability to apply for a wide-range of financial grants, at the local, state, and national level, which it can then use to provide direct support to an entity such as OWWA. In other parts of the world, this is similar to an NGO’s ability to apply for such grants. If OWWA were on its own, it would not have nearly the access to these types of financial grants. Indeed, all three grants that were used to purchase the lease of the fish house and complete renovations were only available due to OFI’s non-profit status. Robin Payne, the Executive Director of OFI, also had the technical knowledge to lead the researching, writing, and application of grants, which in general the watermen did not have the same depth of experience. Another significant benefit of the non-profit organization relationship is the fact that OFI could provide what is known as “fiscal sponsorship” to its direct project of OWWA. This in essence means that OFI as a non-profit organization was able to accept tax deductions for qualifying donations on behalf of OWWA, provided that the funds OWWA received were used for educational and mission-related needs. OFI also agreed to provide OWWA office and accounting support, help in writing business plans, proposals and presentations, develop and maintain a website, plan educational events, develop the Working Watermen’s Exhibit, and support in developing community press relations. Beyond the practical aspects of utilizing the non-profit organization to apply for funding and provide significant technical assistance, OFI’s overall sponsorship of the organizational form helped to ensure OWWA’s mission, providing a sort of “safety net” in case Ocracoke Seafood ever fell apart. Indeed, similar to what Kurien (2013) noted, here, OFI served as a sort of “watchdog.” Prior to the founding of OFI, the community of Ocracoke did not have such support and a number of similar though non-fishing related community-based efforts ultimately were not sustainable as there was no organization to facilitate the projects. Payne explains, “sitting on the periphery, what I saw were numerous groups of volunteers and organizations struggling to address specific needs and support themselves. These island groups and programs had the right idea and the dedication but no government or local support structure readily available”, which resulted in a number of needed projects failing to incubate (Payne, Robin, pers. comm.). Watching this process, it became clear to Payne that a comprehensive non-profit organization focusing on supporting environmental, educational, and social needs in Ocracoke was needed. The non-profit organization would be able to help develop projects, own property (when it benefited the community and/or environment), write and administer grants, and provide community outreach, as well as technical and fiscal assistance. Payne acknowledges OFI’s role and when asked how this model could be adapted to other places in the world, responded that the “process must include not just ‘starting’ but also sustainability. Each country, small town etc. is going to face different challenges. There are ways around them, but it is a different thought process and the watermen themselves will not be the ones who can develop these important paths towards sustainability. So each will need an OFI or similar—an organization that is a marriage of economic development and cultural preservation” (Payne, Robin, pers. comm.). It is important to underscore that Payne is a strong believer that it is crucial for watermen themselves to be involved in initiatives in order to achieve sustainability, but takes the point of view that they must have significant support in these efforts. Payne’s opinion here is similar to CSE theorists’ claims that enterprises are impeded in solving social problems on a large-scale when they tackle them alone. The inherently multifaceted, complex, and deeply rooted nature of the problems taken on by CSE makes it more likely that such problems can be solved only through a collaborative effort of many actors, across sectors and institutional boundaries as they can thus leverage on their own strengths and resources. As CSE theory identifies, the collective action taking place is seeking to solve a variety of needs. Though the collective action may appear to be forming from an individual need, this is rarely the case. In Ocracoke, the collective action efforts began due to the closure of the fish house. However, this merely served as the urgency to spark the work that fully revealed the multifaceted needs and vulnerability the watermen and community were facing. During the needs assessment, though it was always recognized that Ocracoke Seafood was to be run as a for-profit business (and ultimately would end up as a for-profit subsidiary of the parent non-profit organization), leaders realized that a non-profit arm (OWWA) should also be developed. This realization came during initial development meetings with the watermen, which demonstrated that there was both a need for a fish house (which Ocracoke Seafood would satisfy) and a need for educational outreach (which Ocracoke Seafood was not positioned to fill). According to Payne, this need for educational outreach surfaced when watermen began discussing the responsibility they felt to educate the public about the important role the watermen play as stewards of the environment, local fishing heritage, and restoration of Ocracoke’s fisheries, with this responsibility becoming the driver behind developing OWWA. Thus, with these two needs identified, a two-pronged approach was established, with OWWA as the non-profit arm and Ocracoke Seafood as the for-profit arm. Leaders referred to this innovative approach as a “joint business non-profit concept,” (Hilton, David, pers. comm.) with an “attitude of social entrepreneurship” (Payne, Robin, pers. comm.). There was also a significant opportunity once the collective action process had been well established with the new Ocracoke Seafood up and running. Educators, tourists, political leaders, associations, and others visiting the island wanted to learn more about how the island’s last fish house had been saved. “There was a huge story to be told,” Payne said, “up and down the Eastern seaboard, fish houses were closing. Real estate values, cheaper imports and regulations were the primary obstacles. Ocracoke’s story stood apart from other fish houses: ‘Traditional fishing village staves off possible extinction’. People connected with this.” (Payne, Robin, pers. comm.). Thus, Ocracoke tapped into the value of culture, heritage, and authenticity, which often is forgotten when thinking about small-scale fisheries, featuring the story of saving the fish house within the OWWA exhibit as well as connecting to regional, state, national, and international media about their successful collective action process. The CSE concept can be viewed as an overall approach the new supported organizational form took on, by working across a variety of actors and forming different levels of organizations to tackle large social issues. In addition, the individual entity of Ocracoke Seafood specifically takes on a CSE business model. In practical terms, this means that Ocracoke Seafood does not aim to maximize their profit as a wholesaler, which allows more of the economic benefits to go directly to the watermen in terms of the price received for their catch. Generally, fish houses in the region take 30 to 45 cents on every pound, with watermen getting paid the difference. However, Ocracoke Seafood has been able to decrease the margin that they take because of their unique business model, allowing their margin to be “lower than industry average”, thereby covering their fixed costs (labor, ice, cardboard boxes) but not making a profit for Ocracoke Seafood beyond that (Hilton, David, pers. comm.). Though working on smaller margin than other fish houses, Plyler is careful to put this in perspective, noting that though they “work on less of a margin than most do,” it is “not by much” as again, the company must cover its fixed costs in order to operate. However, this does allow for Ocracoke Seafood to pay the watermen higher prices for their catch, which Plyler notes makes it “easier to work with them and keeps them loyal.” (Plyler, Hardy, pers. comm.). Plyler notes that despite these more CSE objective and goals, business objectives must still be in place: “It has to be run like a business…that means no waste, keeping the sanitation rules…it’s got to be done right (Plyler, Hardy, pers. comm.). He also stressed that their unique model does not mean they are immune to challenges that other fish houses experience, noting that the fish house business in the country in general is “all about volume” and holding “a tight line on spending” (Plyler, Hardy, pers. comm.). The organizational form of OFI, OWWA, and Ocracoke Seafood will continue to evolve. Some leaders of the group think that as OWWA grows and continues to develop its mission; it may make more sense for it to become its own non-profit organization. Another thought that it could be beneficial for OWWA to approve the establishment of an endowment fund for educational and travel purposes through OFI. In terms of Ocracoke Seafood, some felt that shares from the company should possibly be given to OWWA rather than be held by OFI. In weighing these decisions, Payne hopes the group understands to ensure sustainability of small-scale fisheries in the community, widespread representation, commitment to and understanding of the mission is essential. She believes that having a separate but mission supportive entity as the shareholders is essential and works to keep all watermen on a level playing field. This story of how collective action worked to save small-scale fishery livelihoods, strengthen the community, bolster participation in fishing regulations, develop educational and restoration efforts, sustain the tourism industry, and emphasize the value of fishing culture in Ocracoke, North Carolina, is an optimistic one. Taking a CSE approach, a variety of entities on various levels worked collectively to effectively overcome the vulnerability and marginalization the watermen and community were experiencing. This approach of collective action would likely be most successful in other contexts that are facing similar regulations on fishing practices, thus making it more probable that it be replicated in other developed countries. This is due to the fact that much of the collective action that transpired focused on how to work with an industry in decline rather than solely against the decline. For instance, OWWA works on a political level to address and participate in state fishing regulations, which threaten the commercial fishing industry. With the help of OFI, the entity also acts on an educational level to raise awareness about the island’s fishing heritage and culture, which is not obvious to the general public. In terms of Ocracoke Seafood, some would argue that the success of the fish house was underpinned by the very uniqueness of a small, fishing community, demonstrating an endangered fishing culture that has died out in most places in the country. In addition, the fact that youth were becoming more involved in fishing showed a viable small-scale fishing industry on the island. Thus, though aspects of this organizational form, such as how the various entities support one another or its inner workings, may be useful in developing countries, this case study is most pertinent to other developed nations facing similar challenges to their small-scale fishing sector. These similar challenges include increased regulations, declining numbers of commercial fishers, lower landings and prices, and growth in cheap imports from abroad, as well as increased tourism development and property taxes. Unfortunately, these challenges are certainly not unique to the small-scale fishing sector in the USA and can be found in many developed countries, making this case study hopefully both relevant and exciting. Though this case study demonstrates that small-scale fishery communities in the USA and other developed nations certainly still have strong potential amidst what many would deem a “dying” industry, it needs to be highlighted that this CSE approach, with several, diverse actors working together to create a collective of organizations at various levels, (non-profit, educational, and for-profit), takes a significant amount of support. This support is a necessary condition for success. In this case study, the support took the form of an individual business loan, financial grants at the local and state level, community participation in the needs assessment, development and construction, and non-profit technical/financial assistance. Underscoring all of this support was the organizational form itself; a form that was able to work with each entity’s strength(s) and establish its own sustainability as well as the organizational form’s sustainability as a whole. For instance, Ocracoke Seafood, as a for-profit business, focuses on buying and selling seafood from the watermen. It does not work towards any educational or political efforts, rather OWWA, as a direct project under OFI, does this. Both of these entities work in tandem with one another; if it were not for OWWA’s increased political participation and raising public knowledge on the importance of fisheries culture, the watermen may not be able to fish and sell their catch to Ocracoke Seafood. The reverse is also true; if Ocracoke Seafood did not provide a place for watermen to sell their catch, fishing would likely not be a viable industry on the island, and thus, all educational and political efforts would not be relevant to participate in. In between all of this, OFI provides a high-level of support through availability of financial grants, technical assistance, and through various other ways to ensure that the work of Ocracoke Seafood and OWWA can continue. Thus, the organizational form that was developed is three separate but linked entities, with each being able to tackle its own goals in the strongest way while supporting the other entities. Perhaps, this CSE organizational form, with linked but separate entities, is the most applicable lesson that could be applied to relevant contexts in both developed and developing countries, as the CSE approach aims to help tackle complex, social problems that are unfortunately occurring throughout the world. The Ocracoke community refers to fishers as “watermen” in order to be reflective and inclusive of all those who work on the water, including those who run charter boats, fish recreationally or who target species beyond fish, such as oysters, clams, and crabs. As “watermen” is the language used by the Ocracoke community, the term will be used in all subsequent sections of the case study and is used inclusively for both men and women. The North Carolina Department of Commerce annual ranks the state’s 100 counties based on economic well-being and assigns each a tier designation. The 40 most economically distressed counties are designated as Tier 1. A correction to this article is available online at https://doi.org/10.1007/s40152-018-0096-6. Census Viewer. “Ocracoke, North Carolina Population.” Last modified 2010. http://censusviewer.com/city/NC/Ocracoke Accessed June 19, 2014. NOAA. “Fisheries of the United States 2011.” Last modified 2011. http://www.nmfs.noaa.gov/stories/2012/09/docs/fus_2011.pdf Accessed June 19, 2014.